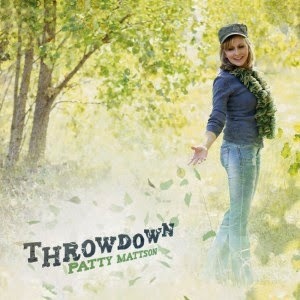 Patty Mattson has released a new album called Throwdown. The recording features seven strong tracks and the voice of a talented woman with the strength and conviction to deliver the words. Even though this recording clocks in at just over 23 minutes Ms. Mattson packs it all into one powerful package with her vocal style and straight forward approach. It’s non-stop entertainment from start to finish. The musicianship is fine throughout the run of this CD and a suitable match for Patty. All thanks go to Simone Sello for a masterful job multitasking and playing all the instruments (with the exception of drums on two tracks courtesy of Billy Pace). I did cover her last full length The Road and was quite impressed so it looks like she picked up right where she left off! This album feels like an EP but the range for that format is 3-5 songs. I think the difference here besides two more tracks are that it’s so darn good, you feel like it ends much too soon. That is a good thing for Patty Mattson. Why this lady is not a star right up there with folks like Carrie Underwood and the like, is beyond me. She has what it takes, and delivers the goods time and time again.